My brother, Neal, fishing Hatch Meadow in 1984. In 1981 I left public accounting for good to start a new career with EG&G Energy Measurements. EG&G was a 40-year contractor at the Nevada Test Site, or NTS (now the Nevada National Security Site). At that time, late into the Cold War era following World War II, the primary mission of the NTS was the testing of the U.S. nuclear weapon stockpile as well as new weapon development, from both weapon physics and weapon effects perspectives. I envisioned this was to be a long-term career change. Shortly after responding to a job ad for Internal Auditor, I was interview by Jim Jones, the EG&G Audit Manager. I was just 25 years old, married with no children yet (although my wife and I had lost our first child, Melissa, in September of the previous year). I believe Jim was 60 years old. I could tell from the interview I would like working for Jim. Although a little crusty, he was lovable. It wasn’t until later that I learned he was prone to drinking cheap wine and dispensing snippets of sarcasm. Ironically, he was just what I needed at that time in my young life. My own father died when I was but 3, mother never remarried, and so Jim was one of several father figures in my life. 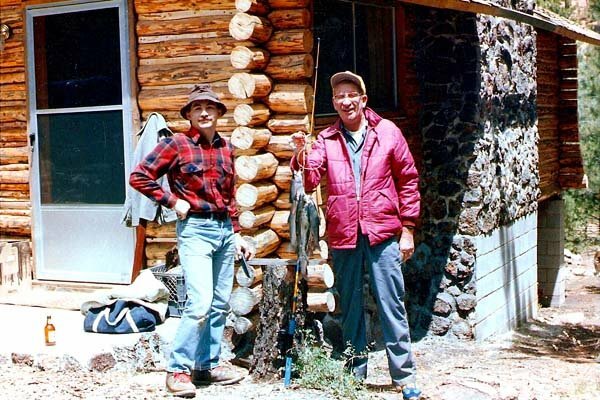 A twenty-six old FisherDad, with Jim at his Yellow Pine cabin, circa 1982. 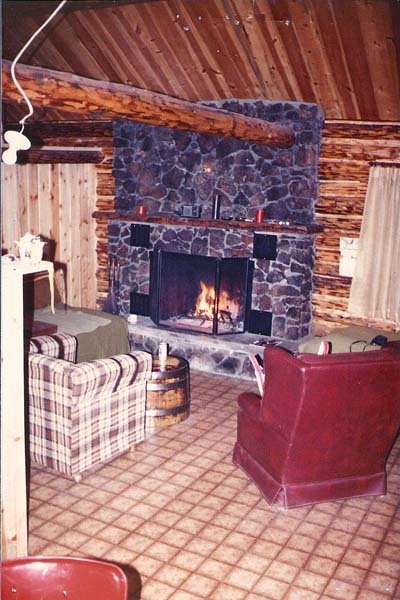 Interior view of the cabin's lava-stone fireplace. Jim had purchased a lot in the Yellow Pine district along Mammoth Creek. For reference, Mammoth Creek drains the eastern slope of southern Utah’s Markagunt Plateau into the Sevier River just south of Hatch, Utah (at 279 miles, the Sevier is the longest river completely contained within Utah's boundaries). At the time I started working for Jim, he had just hired a cabin builder to construct a functional cabin with water, sewer, and electric. It was a one-bedroom, one-bath, full kitchen cabin with a loft and large roofed deck. He invited me there often, particularly in the early spring to help him open it and in the late fall to winterize and close it. 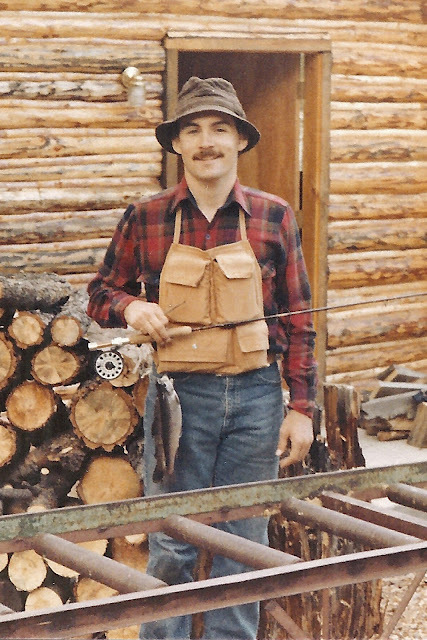 Some might assume I was simply cheap labor, working for time on the trout stream, but I think Jim liked having me around, and I think he saw an opportunity to provide extra mentoring. Through his generosity, I was allowed to use the cabin often, which my young family, including Nick, Doug, and grandma Nanny, really appreciated. FisherDad splitting wood for time on the creek. 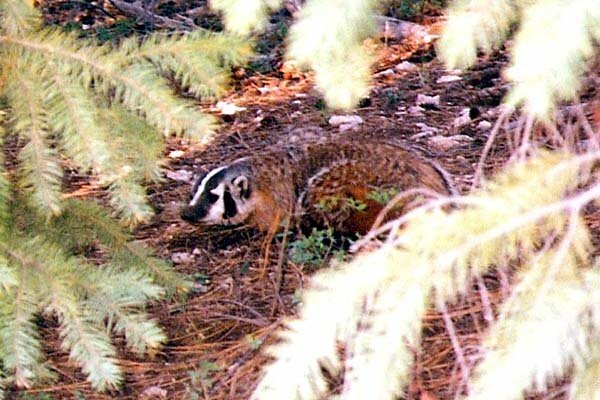 A badger caught crossing the road to Hatch Meadow. 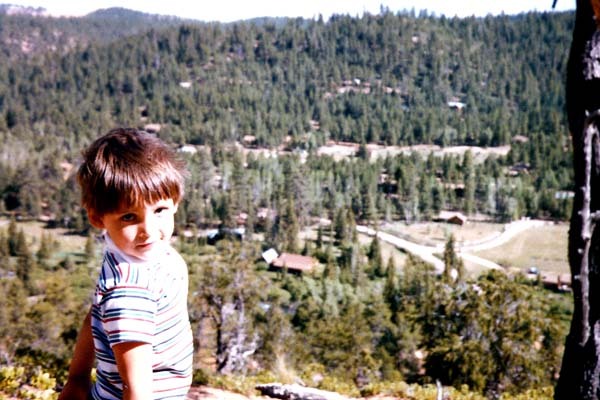 Nick, age four, overlooking Mammoth Creek in Yellow Pine subdivision. Jim and I shared an interest in fishing. 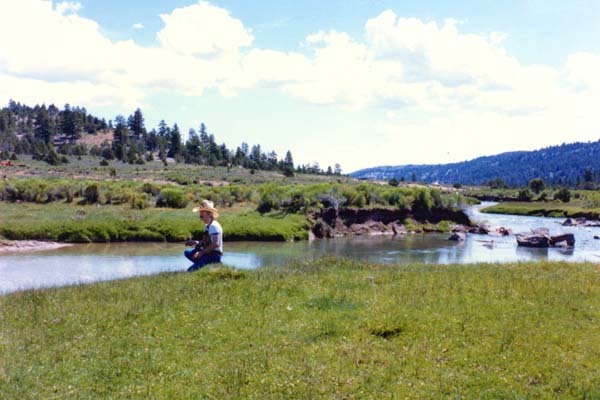 He often talked about fishing Panguitch Lake in a rented boat, but I was captivated by the creek. In my early fly angling history I snobbishly believed creek fishing required a higher technical skill than stillwater fishing. Stream trout were easily frightened because the shallower water seemed to expose them to more dangers, and their feeding lanes were easier to spot which made fishing more productive than on a lake (or so it seemed at the time). Casting skills were at a higher premium on streams because the targets were smaller and the moving water came with all sorts of tricky currents and eddies that disrupted the fly's path and alerted the trout that it was indeed, unnatural. Casting blunders resulted in frightened trout or tangled casts. Stream fishing also came with the added bonus that most folks didn’t explore creeks which left more of them to strong, young men like me. 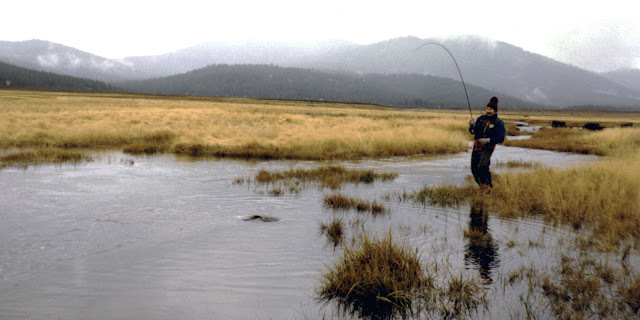 In the 1980s I was mostly fishing Beaver Dam Creek near Caliente, Nevada. Mammoth Creek was a new challenge because it was at least twice the size and known for holding decent sized brown trout. 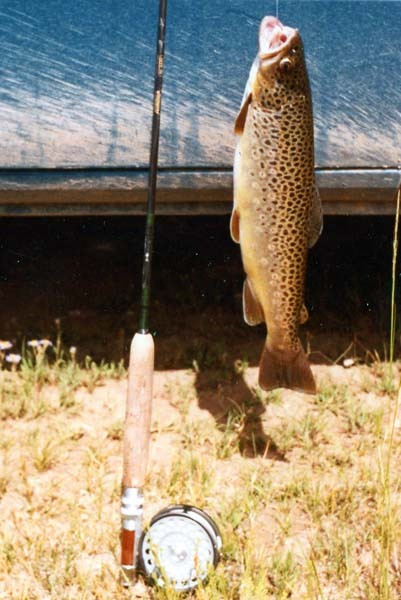 I had caught a few brownies with my brother Neal at Cave Lake outside Ely, Nevada, so I was already bitten by the brown-trout bug. In fact, Neal had told me about a fly angling friend who caught an eighteen inch wild brown trout underneath the bridge at the end of the large Hatch Meadow stretch of Mammoth Creek. That story made me willing to do any hard labor just to get the chance for one of those wild brown trout. 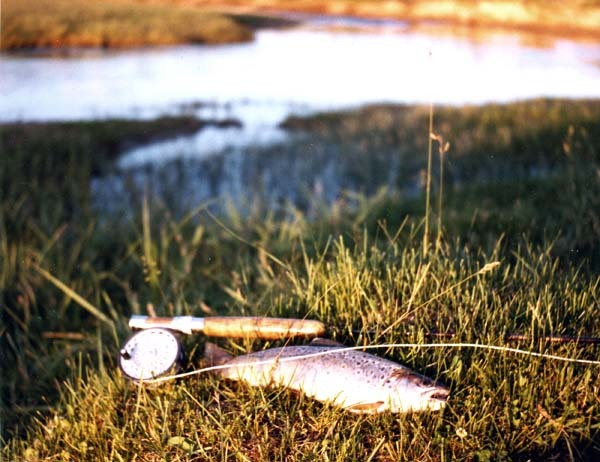 A favorite photo of a twelve-inch brown trout laid on the grass in a Mammoth Creek sunset. orange slash on its lower jaw. 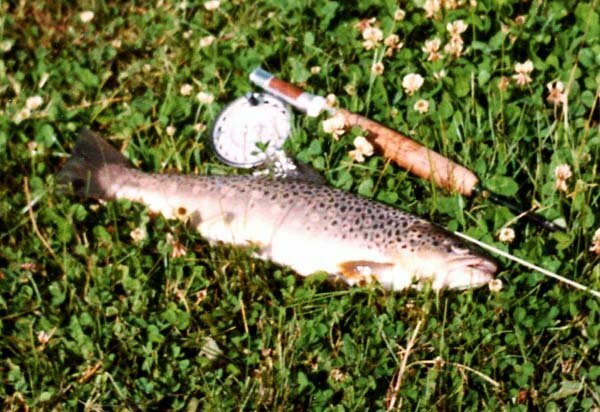 Here's the sixteen-inch brown trout laid on Mammoth Creek clover. Fishing the meadow section of Mammoth was not easy. There was no cover for the fish, just deep cut banks as the creek meandered through the grazing pasture. I never caught more than one or two fish during a two-hour fishing session, and they usually were ten to twelve inches. However, there was one memorable trip when I was fortunate to catch a very healthy sixteen inch brown trout. I was casting upstream using a nymph pattern I tied from fur I had raked off Buffy, our gray calico cat. I think the fly resembled caddis fly larvae in a stone casing, but who knows what the trout thought it looked like. I cast blindly upstream from the left side just below where the creek cut deep into the bank as it switched directions. From my position I couldn’t see the fly or my line, so I was simply stripping line in as it drifted back down to me when I felt the line go taught. 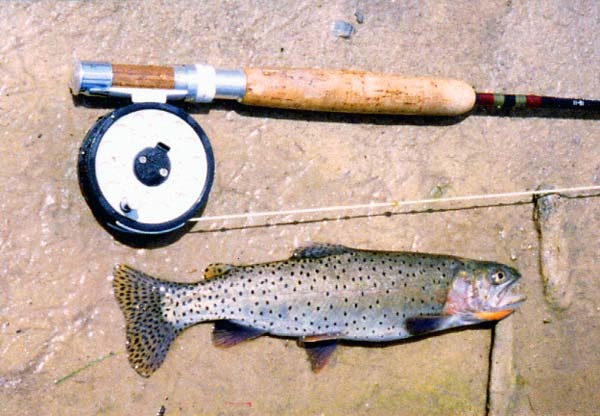 The trout fought stoutly; it was the largest I had ever caught at that point in my fishing experience. It was beautifully and traditionally colored for a fall brown trout. It was a female full of roe, and I felt very guilty for killing it because the opportunity for her to spawn new wild trout was lost forever. A crass photo of the same sixteen-inch brown trout. ﻿﻿So yes, the competitive streak during my early years often caused me to kill the fish I caught; otherwise who would believe me without the evidence? Jim spurred my competitive spirit as he saw that I had an arrogant fly fishing streak, and he frequently used sarcasm lubricated by Petri labeled wine to challenge my fishing prowess. In the moment I knew I had to kill that sixteen-inch spawner to save face with Jim. Perhaps my current propensity to count the fish I catch is driven by that old geezer’s banter about the performance of worms vs. flies. Looking back, I know he meant no harm other than to knock me off my self-ascribed pedestal. Still, I’d love to fish with him on Panguitch Lake today and see who’d catch the most and largest fish! 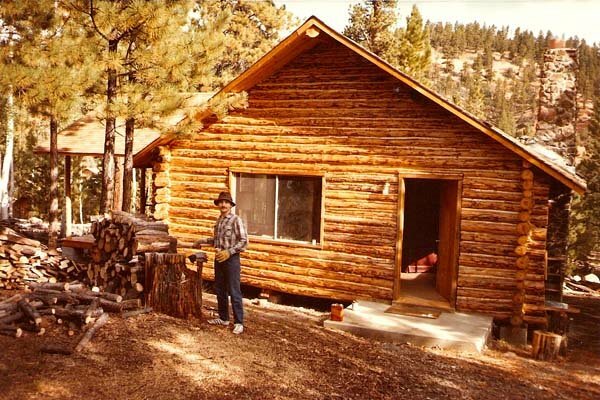 Although it’s been a couple of decades, I still have warm memories of Jim and the cabin. He enjoyed bestowing fatherly advice about everything from marriage and children to career development. I honestly appreciated all that he shared with me, much of which I took to heart. Sometimes I wish I had bought his cabin just to keep more memories alive. 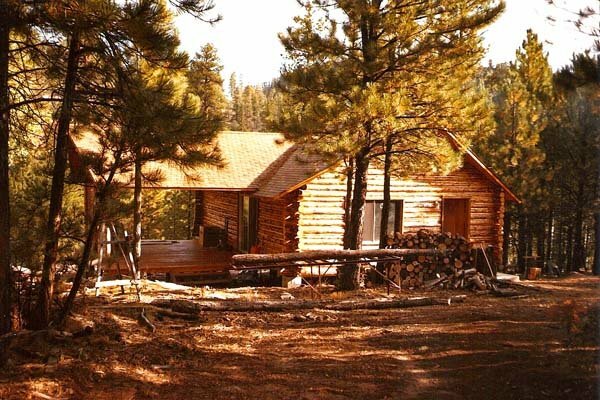 I will visit Mammoth Creek again, probably drive by the old cabin, and cast a line out in memory of Jim Jones and his beloved cabin.